Earlier this year, I had the opportunity to speak at a National Wear Red Day lunch-and-learn at SAS. I was invited to share my data and experiences as we marked a day devoted to raising awareness of the sobering statistics about cardiovascular disease risk among women. Heart attack and stroke are responsible for one of every three deaths in women, and kill more women than any other diseases by a wide margin. On the bright side, many important risk factors for these diseases are lifestyle-related and largely under our control. Over the past decade, National Wear Red Day has promoted awareness of these risk factors and helped bring to light gender inequalities in cardiovascular research and health care. Many women are now actively reducing their risks by adopting the Simple 7 lifestyle changes recommended by the American Heart Association. Although I have blogged about my personal diet and fitness data and presented a Discovery Summit 2014 e-poster on the topic, this lunch-and-learn represented the first time I publicly discussed the connection between my own lifestyle data and my risk factors for heart disease and stroke. I shared this connection in part because cardiovascular disease has touched my own family. I lost one grandmother when her doctor misdiagnosed her symptoms as anxiety, failing to recognize key heart attack symptoms experienced more often in women than men. My other grandmother experienced a series of debilitating mini-strokes late in her life. I share these sad stories to help explain why I am passionate about encouraging more women to take active steps towards positive health changes and do what they can to maximize their chances of living to see their children, grandchildren and great-grandchildren grow up. 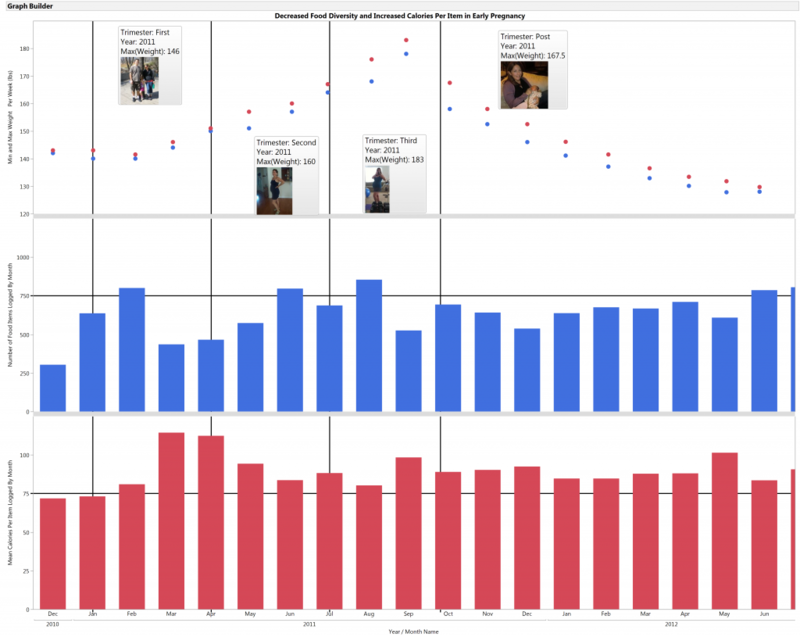 If you saw the first post in my fitness and food blog series, you saw how I took advantage of a new JMP 12 feature to embed pictures of myself in my weight data table. I pinned several representative pictures to my historical weight graph to highlight the changes in my body weight over the past 15 years. My weight metric tracks predictably with my other cardiovascular risk markers, like blood pressure, body fat, waist circumference and blood cholesterol composition. Unlike a cholesterol test, however, tracking my weight is easy to do at home; as a result, I have lots of historical data! When I showed my weight graph during my talk on National Wear Red Day, it immediately resonated with the women in the audience. I heard from several people that seeing my pictures (in second graph below) made the ups and downs in this chart much more meaningful than without (first graph below). Obviously, I have been through many weight fluctuations over the years. I first actively tried to lose weight through dieting and exercise in middle school. I recently obtained my medical records from my undergraduate years, and they reflected a similar pattern to other stressful periods in my life. I gained weight (12 pounds in the first semester), and I continued to pack on the pounds as the years went by, gaining a total of 30 pounds during my undergraduate years. It has taken me many subsequent ups and downs through graduate study, parenthood and my early working years to learn that adjusting to life's stress does not have to mean giving up on my weight, health and fitness goals. In the past, I shelved healthy habits and stopped tracking during holidays or when my time was tight. I then felt like a failure, and this negative thinking led me down a path of declining fitness, increasing weight and rising blood pressure. In reviewing my data in notebooks, I realized that I have always been most successful when I am actively tracking my efforts. Several years back I recommitted to adopting data collection habits permanently, and this has helped me in the process of desensitizing my weight loss and maintenance efforts. Even in such an emotionally charged area, data can just be data, and continuing to collect it motivates me to keep my established habits going even during busy times. I track my food and workouts regardless of schedule, and have learned to both scale down my routine during hectic stretches and enjoy social eating events without stress. My yearly health metrics now reflect my long-term commitment to positive lifestyle habits. As I mentioned earlier, increases in my weight always lead to my other risk biomarkers heading in the wrong direction. It is hard to statistically separate the effects of diet and exercise on my biomarkers, since I tend to adopt a constellation of healthy lifestyle behaviors when actively working to address my weight. However, I observed that my risk biomarker numbers tend to be at their best levels when I am within my current, healthy maintenance weight range, and my cholesterol composition is not quite as good when I rise above that range. As I showed in my talk, and you can see from the pink shading in the graph above, hearing the bad news about my heart disease risk biomarkers in early 2008 didn't prompt me to take action right away. In fact, my weight rose another 10 pounds over the next 18 months (during which I avoided yearly blood work) before I reached the point where I was ready to make the changes I needed. The important thing is that I did manage to make positive changes -- although my total cholesterol has stayed fairly consistent around 200, you can see from the graph above that the composition of my good and bad cholesterol has changed greatly since 2008. My ratio of total/HDL ("good") cholesterol was 3.8 in 2008, close to a worrisome threshold of 4, but now sits near 2 since raising my HDL 40 points and lowering my LDL 40 points. In looking at this data, I wish I had access to multiple measurements at the same time to get a sense of my variation. 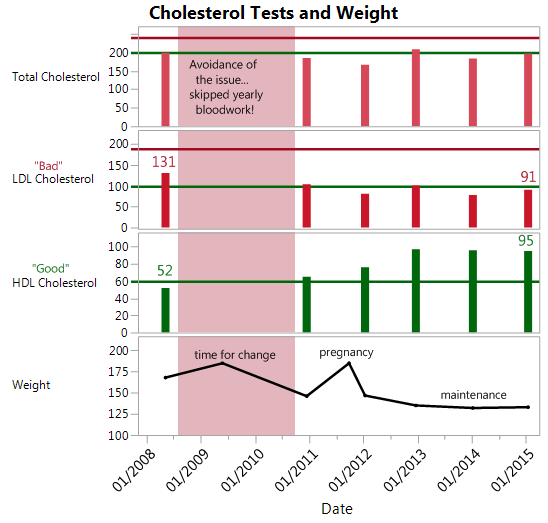 Did having my blood cholesterol test on the Monday after my 2015 holiday break affect my numbers at all, compared to waiting a week post-vacation? Without cholesterol issues, I don't have an easy or inexpensive way to get more frequent cholesterol lab tests. Unfortunately, home blood cholesterol tests are expensive and don't provide the kind of detailed information I get from my yearly blood work. Although I don't have an identical twin to serve as a replicate, my youngest sister is almost exactly my height, and we look and are built very similarly. She shared with me her own cholesterol improvements after her 35-pound weight loss: She increased her HDL 6 points, reduced her LDL 25 points and reduced her triglycerides 33 points between June 2010 and November 2014, while her Hemoglobin A1C levels (an important biomarker for type 1 diabetics like her) dropped significantly. I helped coach my sister through the changes she has made, and we in turn helped coach my mom and other sister as they have both improved their heart disease risk through lifestyle changes. My mother lost weight, became more active and improved her own cholesterol numbers. Between me, my mom and my two sisters, we have lost a combined total of more than 200 pounds over the past several years using the same strategies I have showed through my previous blog posts: reducing calorie intake and increasing activity to achieve a calorie deficit. I started this blog post by talking about family, and will end talking about it, too. I think we sometimes forget the positive ripples that achieving health improvements can have on our social networks. I shared how my changes influenced my immediate family, but it goes even further than that. Once my mother achieved her own positive changes, she became a positive influence on a friend's post-stroke weight loss efforts, and her friend has now lost more than 100 pounds and adopted several new exercise activities. Create a new column and change its Data Type to Expression. Drag or copy/paste your pictures into appropriate cells in your Expression column. If desired, change the marker color of the rows that contain pictures so that you can easily identify them in graphs. Hover over points with pictures and pin the hover labels to keep them visible. Keep in mind that the size of your pictures will affect the final size of your table when open in memory or saved to your file system. If you have the space to save large images in your table, yet want to use smaller sized versions in your hover labels, you can open up the Column Info dialog and select Expression Role near the bottom of the Column Properties list to modify the size of the picture as shown. 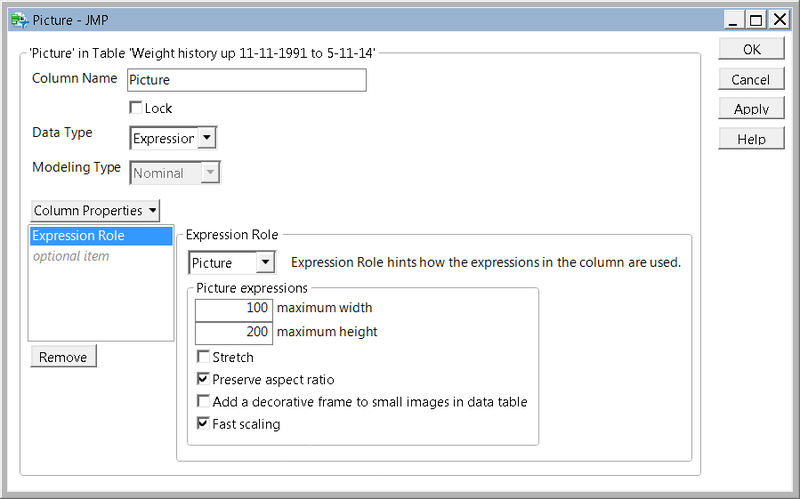 Also new in JMP 12 is the ability to change the height of data table cells, so you can adjust the size of the thumbnail image as shown in your table. 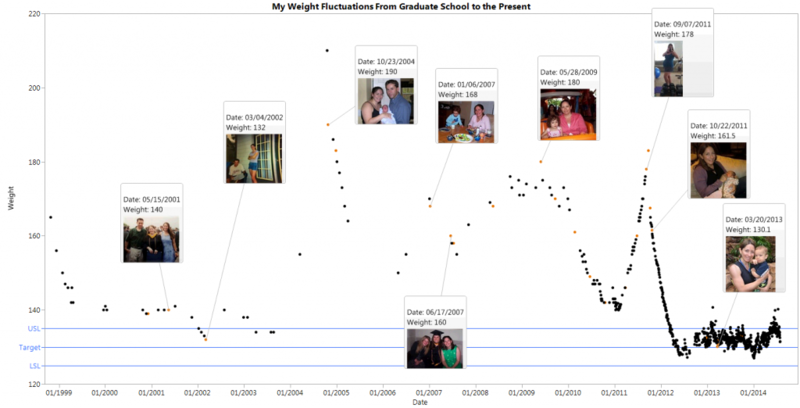 I also used images in one of the final graphs I showed in my Discovery Summit 2014 e-poster to track my pregnancy weight changes alongside pictures of my expanding belly. Although I didn't end up including this one on my poster, I created an expanded version of this chart that included summary information about average calories per food item and average number of food items logged per week during my pregnancy. I noted that there was a definite decline in the diversity of my food log during March and April 2011 and a rise in the average calories per item logged. What was going on here? I suspected I knew the answer, recalling that early in my pregnancy, I struggled with an aversion to coffee, dairy, and many green, fresh vegetables. I reviewed my detailed food logs and summarized them with treemaps using the local Data Filter in JMP to restrict date ranges, as described in this post. My suspicions were confirmed: During the months when my stomach was most unsettled by nausea, I ate more combination foods and starchy carbs than usual, which were more calorie dense than my usual food choices. What uses can you think of for pictures in your data tables, either for your own personal data or work-related projects? I think the possibilities are simply endless!